“[He] told her it wasn’t working out. Taylor is really upset and hurt. She doesn’t know what she did for him to put a stop to it. She feels really burned by him,” a source told Us Weekly. Check these pictures inside of Jake Gyllenhaal jogging around Hollywood, yesterday. This entry was posted in Actors, Celebs, Reality on January 14, 2011 by admin. 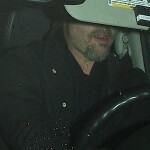 Angelina Jolie and Brad Pitt take their family for dinner at Benihana Restaurant on Sunday, January 2, in Beverly Hills, California. The family is back home after spending time in Springfield, Missouri visiting Brad’s relatives for a post-Christmas get together! While in Springfield, Angelina stopped at a Barnes and Noble for a fresh cup of coffee with her daughters Zahara, 5, and Shiloh, 4. It was just announced that Brad and Angelina donated $2 million to a wildlife sanctuary in Namibia, where the family spent their Christmas holiday. This entry was posted in Actors, Celebs, Reality on January 5, 2011 by admin.